The Solido Euro wall hung suite is perfect for bringing great style to any modern bathroom setting. Without any compromise on style and good looks the wall hung option provides a bathroom design solution delivering a completely clear and open floor area. The Euro Ceramic range has been specially designed to match up an excellent performance with an attractive price. 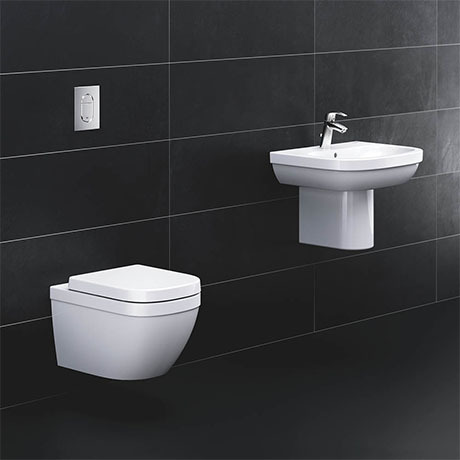 The Solido Euro/Arena WC package consists of a support frame and cistern, dual flush plate, wall hung pan and soft close seat. The steel support frame gives you the freedom to design your ultimate bathroom by providing a secure and quick method of installing WCs. Each frame comes pre-assembled with sanitary ware fixings and is subject to stringent testing. The Euro Ceramic basin and half pedestal will make a subtle difference to any bathroom look. It features a single tap hole and built in overflow. Manufactured from high grade vitreous china and finished in Alpine White, it's durable surface will look good for years to come. Basin is avaiable in various sizes.